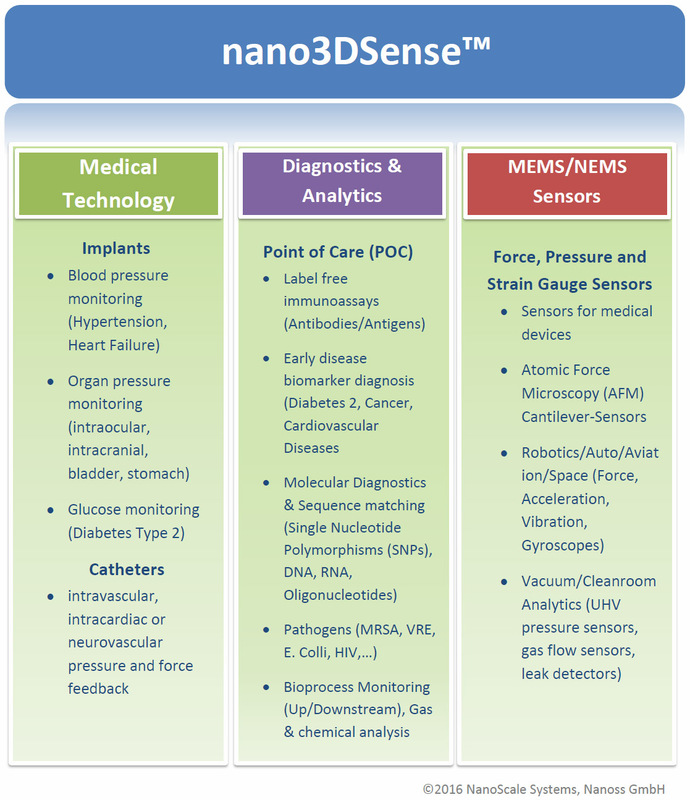 Numerous measuring and detection methods in life sciences, medical technology, analytics, diagnostics, micro- and molecular biology use simple mechanical properties, such as force, pressure or strain. 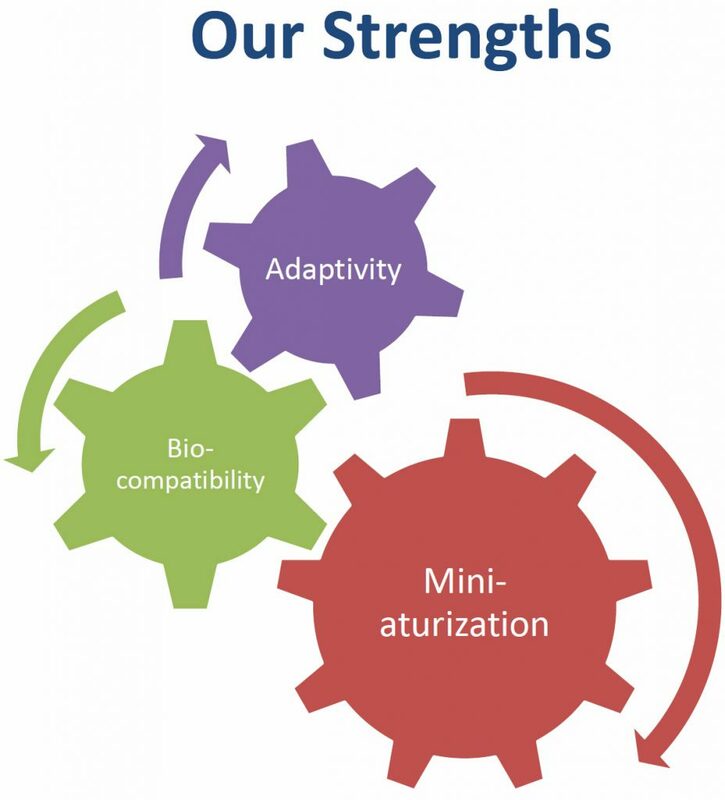 In the case of applications for the sophisticated micro world in biological or chemical analytics, the detection of antibodies and proteins, cell analytics, force spectroscopy or biocompatibility for medical devices: When entering new territory in the micro world, the focus is on miniaturization and adaptivity. nano3DSense sensors technology was designed from scratch for this purpose: The first 3D printing method on the true nanoscale provides a powerful multi-purpose cross-technology platform for challenging measurements in highest possible resolution and with incredible adaptivity for your innovating medical applications. Many new ideas, e.g. label-free antibody detection, medical pressure sensors and high-performance force transducers (e.g. in atomic force microscopy (AFM)), which cannot be solved traditionally anymore, have already been successfully implemented for our customers using nano3DSense. Nanoss GmbH has pioneered in this field to offer optimum solutions even under extreme requirements on the measuring environment, even when conventional cleanroom technology fails. Our company sets new standards with unrivaled miniaturization capabilities and flexibility advantage simply by design. And this even under difficult conditions for the materials used or the measuring environment. Contrary to traditional sensors, our sensors easily adopt to the measuring requirements. And not the other way around! This technology can be advantageously used e.g. for force, pressure, acceleration, or other measurements, e.g. in medical technology, diagnostics, analytics, robotics, and in the aerospace or automotive industry. A single technology platform offers multi-functional solutions for industry as well as demanding R&D tasks if uncompromising requirements are placed on precision and adaptivity. Find out about the various application features of the nano3DSense technology – also for your new application ideas. We are looking forward to advice and support you in the migration of existing sensor systems, and to help you in the realization of your own ideas, from initial planning to the finished product.